A creative, visually-captivating experience for children, young historians, and Civil War enthusiasts alike with single-page introductions for each day of the battle and lots of "have-to-know” facts, all wrapped in a photographic essay of the Gettysburg battlefield as you've never seen before. 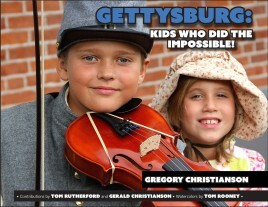 Gettysburg: Kids Who Did the Impossible! is a creative, visually-captivating experience for children, young historians, and Civil War enthusiasts alike. Gettysburg was one of the most important battles of the entire Civil War, and author Gregory Christianson brings it to life through breathtaking photographs, extraordinary watercolors, and exciting true-to-life stories. This is the perfect platform for “story guides” Liam and Jaden to celebrate Gettysburg’s young heroes—kids who defied age and inexperience to serve their town, country, and fellow human beings far beyond common valor. This remarkable and wholly unique presentation has something for everyone: single-page introductions for each day of the battle and lots of “have-to-know” facts, all wrapped in a photographic essay of the Gettysburg battlefield as you’ve never seen before. Photographer and author Gregory Christianson lives in Gettysburg and has been walking the fields near his family home since he was a child. The idea for this book came about when he realized there were few books suitable for younger readers and families. Greg is the former publisher and editor of the award-winning Unsung Hero magazine, and the author of the well-received The Reconciliation of All Things. He keeps fit by tramping the battlefield in search of the perfect photograph and by coaching and playing soccer at every opportunity.